The glory days of Fall, Indian Summer in it’s finest moments is fading fast like the last car of a train bound far away, and it speaks with an urgency “Go out there! Enjoy this!” because we know soon enough, this too will feel like an afterthought. I’m wearing a tank top and it’s October 9th and I think that this feeling is something I wish to burn in my memory to carry around in January, and again in those late and dark days of March where winter feels interminable and the thought of Spring is like a dream you can’t quite recall. It’s dusty and hot and I love it but the dryness tugs at my throat as the dirt rises against my wheels. The continual thrum of rubber on the road is sometimes the only noise I hear, that is, until I hit the patch of leaves and crunch my way through. No patch sounds the same, feels the same or even looks alike; these piles of Autumn’s detritus. I could kick them, or run my bike tire over like today and every sound speaks of Fall, but is completely new. I could ride forever on a day like today, all halcyon and copper, flashes of yellow, red and gold whipping past me and the wind on my face. The road is pretty quiet, cars gone elsewhere to enjoy the sunshine and I ride alone, without loneliness. I can’t ever feel lonely outdoors. It’s alive and it’s vibrant and it’s stoic in it’s stand against the seasons, rarely faltering or shrinking back from the blazing heat nor the snow and rain. It’s admirable, really. We could take lots of notes from the stalwart life of a mighty Cottonwood. My plan is working as the hum of my bike and clicking of the changing gears begins to churn the mass from my mind. I can let go of days, events, time and stress by letting loose in nature, and with each gear change, it’s like clicking open different parts of my skull to allow it all to pour out, freeing me to think straight again. I need to get myself out and away, putting behind me the Instagram days where I filter over the picture of my reality, making it softer, cleaner, or giving it a whole different feel in order to make it tolerable. It’s my coping mechanism when the world begins to disappoint and crush. But my favorite world, the one that never lets me down, is among the trees and leaves, on the waters edge watching a hundred geese make their smooth landings, the wind tickling the hair on my arms. Ten miles have passed, nearly without effort and I am making my way home. I’m tired, sweaty now and a bit off kilter from this purge of last weeks life. It was a big week, with a lot of amazing happenings and even when it’s gone and over, there is still a residue behind, that little bit that requires some extra scraping to remove. I’m worn, feeling empty, but I’m elated too, ready for another go at it. The wind feels cold almost, against the sweat under my helmet. I stretch, feeling every muscle sing with the energy I’ve just poured through my limbs. I dream of the hot shower, clean clothes and relaxing afternoon ahead. 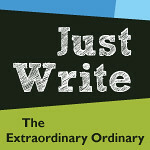 Visit The Extraordinary Ordinary for more of this week’s Just Write series. I love this connection to nature, this respect that you own, this strength and endurance that you nourish. It’s all lovely, really. Me too. I feel this same way, about being outdoors and emptying my brain and it being impossible to feel lonely outside. I loved this. Again. Thank you. this is a love letter, and i soak it in. Lovely post, Kate. I could see those colors, hear those leaves crunching, feel the wind rushing past as you rode. Such a gorgeous time of year, and I definitely get the feeling of wanting to bottle up it for the long winter ahead.